Free Shipping Included! 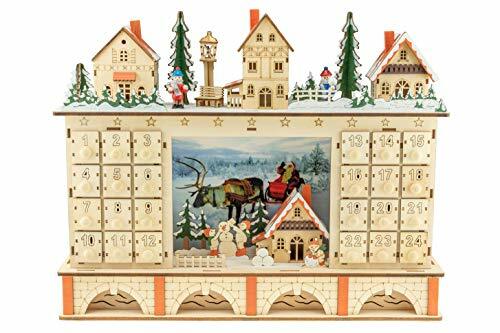 Clever Creations Traditional LED Wooden Advent Calendar Decoration | Festive Christmas Village Design with 24 Drawers | LED Christmas Lights and Santa Photo | Battery Operated by Clever Creations at My Athenas. MPN: 806810338933. Hurry! Limited time offer. Offer valid only while supplies last. PERFECT SIZE: Measuring 14" tall, 4" long, and 17.5" wide, this will fit perfectly on a wide variety of tables and shelves so you can decorate anywhere in your home! The drawers are 1.75" deep, 1.25" tall, and 1" wide, allowing for a large selection of items.